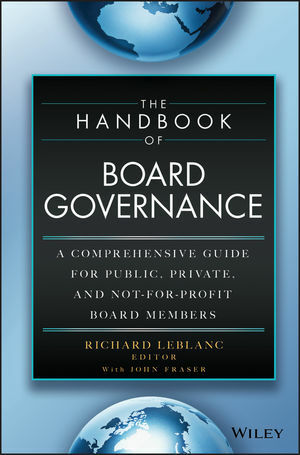 The Handbook of Board Governance provides comprehensive, expert-led coverage of all aspects of corporate governance for public, nonprofit, and private boards. Written by collaboration among subject matter experts, this book combines academic rigor and practitioner experience to provide thorough guidance and deep insight. From diversity, effectiveness, and responsibilities, to compensation, succession planning, and financial literacy, the topics are at once broad-ranging and highly relevant to current and aspiring directors. The coverage applies to governance at public companies, private and small or medium companies, state-owned enterprises, family owned organizations, and more, to ensure complete and clear guidance on a diverse range of issues. An all-star contributor list including Ram Charan, Bob Monks, Nell Minow, and Mark Nadler, among others, gives you the insight of thought leaders in the areas relevant to your organization. A well-functioning board is essential to an organization’s achievement. Whether the goal is furthering a mission or dominating a market, the board’s composition, strategy, and practices are a determining factor in the organization’s ultimate success. This guide provides the information essential to building a board that works. The board is responsible for a vast and varied collection of duties, but the singular mission is to push the organization forward. Poor organization, one-sided composition, inefficient practices, and ineffective oversight detract from that mission, but all can be avoided. The Handbook of Board Governance provides practical guidance and expert insight relevant to board members across the spectrum. PROFESSOR RICHARD LEBLANC, CMC, BSc, MBA, LLB, JD, LLM, PHD, is one of Canada's leading experts on corporate governance and accountability. He is an award-winning teacher, researcher, lawyer, public speaker, consultant, and specialist on boards of directors. Steven Hall, Nora McCord, and Steven Hall Jr.